← Is Veganism righteous in a Christian sense? Vegetarian experience on European British Airways flight. 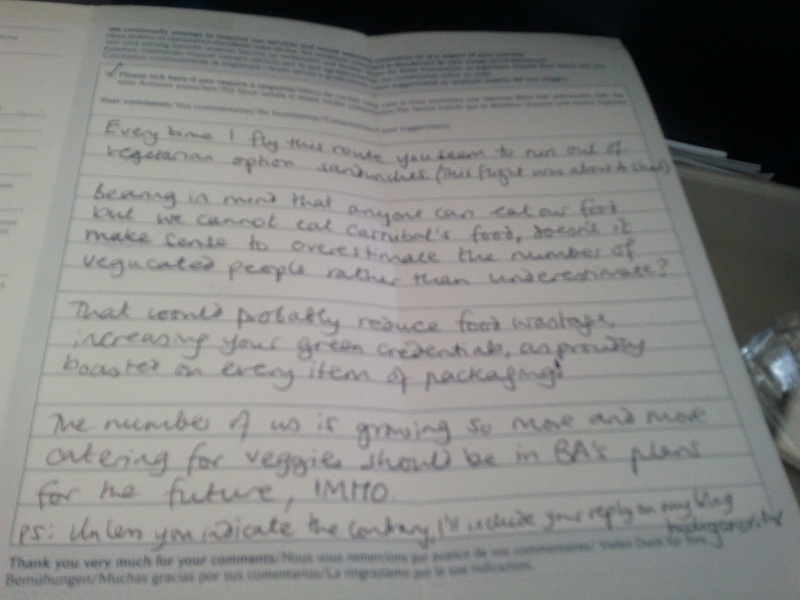 I attach the scan of my comments sent in today during the British Airways flight from Heathrow to Warsaw. It would be self-explanatory, if one could actually read it, so I will type it out to make that a bit easier. Every time I fly this route you seem to run out of vegetarian option sandwiches. This flight was about 4 short. Bearing in mind that anyone can eat our food but we cannot eat carnibals’ food, doesn’t it make sense to overestimate the number of vegucated people rather than underestimate? That would probably reduce food wastage, increasing your green credentials, as proudly boasted on every item of packaging! The number of us is growing, so more amd more catering for vieegies should be in BA’s plans for the future, IMHO. So there we have it, I’m awaiting their response and you will be able to read that in an updated version of this post if you’re subbed to us here on Huliganov.TV. I want to say clearly that this is no reflection on the cabin crew, who were outstanding today. Lindsay who was handing out the food actually went above the call of duty and raided the catering for the return route so as to get vegetarian sandwiches for the 4 of us who otherwise would have gone hungry. Roberto who was bursar explained also about how once people who are really vegetarians get a veggie sandwich, a lot of other people looking on would would quite like an egg sandwich even though they are quite happy to eat a ham sandwich if there’s no alternative. The problem is that on the flights with real meals you can book a vegetarian option, but there’s no way of booking a vegetarian option beforehand on the snack-based flights that we have around Europe. So anyone who books into an economy class on a European flight will not be able to state a dietary preference – which would be all very well if all the snacks were plant-based and kosher but since they are not (I made the point also, which was well taken by Roberto, that the UK to Poland flight is sometimes going to hold parties of Jewish kids on excursions to Auschwitz or to heritage places, and they are not going to be able to take a ham sandwich either. This is not, repeat not, the fault of the people handing out the food and drinks on the flight, who could not have been better especially as it was a busy flight today, but this is just a call to the guys on the ground who design these meals. We read on all the wrappings how concerned BA is to have sustainable this and free-trade that, but still the choice of any meat, especially ham in sandwiches means that the ethics in place are still falling short of the expectations of a growing number of passengers. Lindsay was kind enough to provide me with the information that 16 of the 123 sandwiches provided for the flight were egg and cress, the rest were the meat option. This means in fact that the estimation of the people planning the food was 13% vegetarian. This in itself, all else being equal, would in fact be a reasonable reflection of the current level of vegetarianism in most of Europe. I researched it the other day when my mother said it was for a lunatic fringe of cranks and the sources I saw put it between 10-15%. However, the point Roberto made that in his experience as soon as the first vegetarian has refused the meat and taken egg, then a larger number of people suddenly start wanting to exercise a choice, this means that you cannot really just go on the basis of the number who are vegetarian. It is hard for cabin staff to start challenging people’s vegetarian credentials in the flight over an egg sandwich. And on top of that, in the UK there is getting on for 10% of the population who won’t eat pork on religious grounds even if they are not vegetarian. Diversity is a hallmark of what modern Britain stands for, and an airline flying our flag, and hoping soon to boost its fortunes no doubt with travel to the UK of people from all over the world both for the Jubilee of Queen Elizabeth II and also the Olympics in London coming up very soon now this year, is duty bound to have this approach in its menu choices. Like it or not, vegetarian sandwiches are acceptable to most religions and to vegetarians also. About ten percent of vegetarians are full Vegan of course, but they are aware in any event that they are hard to cater for and if someone wants to be a no-exceptions Vegan and not an 80% Vegan like me, they will have to prepare their own in-flight food for a good while in the future, I expect. If I were uncompromising, I’d be a Vegan too, but I sometimes have to go half way in a social situation and accept egg and dairy products, but then I do expect that these options are readily available, and that’s the other party’s part of the compromise as I see it. So what’s my recommendation to BA? And to representatives of other airlines who may have stumbled upon this? I would say that if your main sandwich is chicken or fish, you might get away with 35% vegetarian option and 65% your chicken or fish option. But if you are doing pork or shellfish, you probably need about 55% vegetarian option. The clincher really is what I started off with in my note, that carnibals can almost always eat vegetarians’ food. They may not like it, or indeed they may have discovered that veggie food is tastier than meat based food, but there are very few who can’t eat it at all. The same is not true when the only remaining option is the meat option and as the cabin staff get down to the tail end of the plane they are coming up against people who are not happy because they will be going hungry when others are eating. The advice given is to let the cabin staff know if you are vegetarian, so that they save one for you from the people who are taking the vegetarian option facultatively, but surely a better option is to let people choose and to have it so that when the choice finally does run out, at least the one thing left is something that we can nearly all eat? I await the British Airways response – they’ve got my email. Unless they tell me I’m not supposed to publish it, you’ll also see it when they do respond. Posted on 01/04/2012, in Britain, Culinary, Travel and Places and tagged British Airways, vegetarian, Vegetarianism. Bookmark the permalink. 3 Comments. Thanks for sharing your Europe trip experiences with us as I am going to teach English in Europe so I will be also getting some good experiences while traveling. Vegetarians, suffer the tyranny of the masses in the same way that anybody asking for any goods or services that are not mainstream does. How many times does one hear from sales staff “there’s no demand for that” or “there isn’t much call for that” when they have a request for something that is not the choice of 95% of the population ? In commercial terms, you are not allowed to be an individual with individual requirements. The message seems to be if you do not want what the advertising world has indoctrinated you to want then you are freakish in some way. There are still too many people who believe that “you need to eat meat in order to get an adequate supply of protein” even though there are many living examples of vegetarians who prove this to be the bunkum that it is. Despite the little progress made to date there is still,sadly, a very long way to go before vegetarians are fully catered for. But, thankfully,with people like “uncle D” on the case things can only get better.